It may seem like an unlikely place to visit with children: an art museum. You may be concerned that your child will be bored, cranky, or worse- so hyper that he or she goes sprinting through the exhibit halls touching every priceless masterpiece. For a while, that was my nightmare. For years, we stuck to the children’s museum- aquarium-zoo circuit. However, now that my children are out of the toddler/preschool phase, I’ve been trying new places with them when we travel. So, when I ordered tickets to Peter and the Wolf at the Guggenheim in New York City (read about the various holiday things we like to do in New York City here), I thought it would also be fun to check out the museum. The Guggenheim in New York City was designed by famed architect Frank Lloyd Wright and opened in 1959. The iconic building on the Upper East Side is located across the street from the Jackie Kennedy Onassis Reservoir, part of Central Park. There are walking paths (1.58 miles) around the reservoir. The spiral shaped main hall showcases a rotating exhibit from the permanent collection as well as traveling exhibits. When we visited in December of 2018, there was a Hilma af Klint exhibit entitled “Painting for the Future” on loan from the artist’s estate. The main exhibit changes about every six months. There are also two galleries showcasing artwork from the permanent collection, including artists Georges Seurat, Camille Pissarro, Edgar Degas, Edouard Manet, Wassily Kandinsky, and Pablo Picasso. Guggenheim educators lead daily tours and there is an app for audio tours. 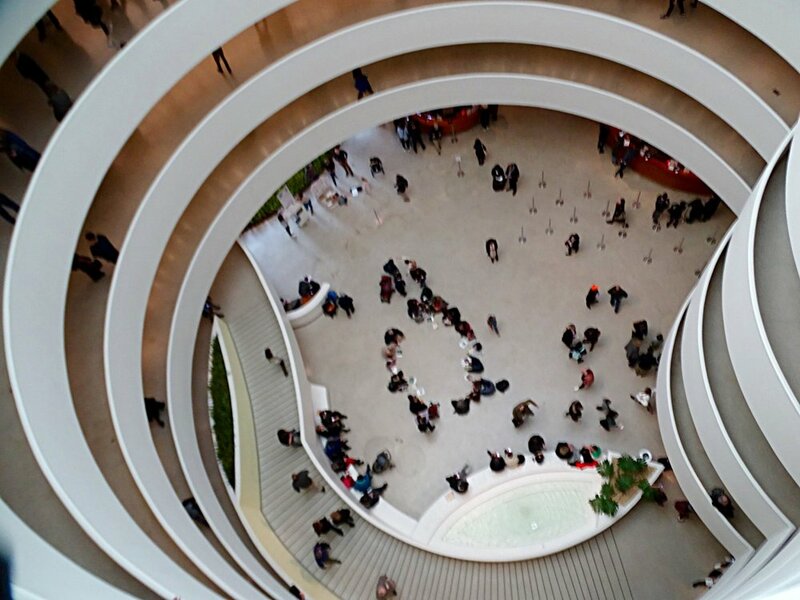 The Guggenheim has a wide variety of family programs, from weekly “Little Guggs” art classes for toddlers to monthly “Stroller Tours” for the infant crowd to whole family tours and studio workshops. The Children’s Book Illustrator Series is especially popular with families, affording an opportunity to participate in a workshop with well known illustrators. Check here for the full calendar. I would strongly advise visiting with children on the weekend. Volunteers run a Family Activity Station and loan sketch pads and scavenger hunt kits to children. My kids LOVED the scavenger hunt. In addition to finding specific artwork, they had tasks to complete, bios to read, and sketches to draw. Several times, my son paused to sit on a bench to duplicate a painting he liked. There is a paper booklet of the scavenger hunt available anytime, but the Station and supplies are only available on the weekend. Check coats on the lobby level. Small purses are allowed but larger backpacks must be checked. Single strollers are allowed. Children under 12 receive free admission and every Saturday from 5-7:45pm, adults pay what you wish (suggested donation of $10). The Guggenheim is part of the New York City CityPass. Restrooms are located on just about every level. The entire museum has elevator accessibility. The spiral structure of the museum is visually appealing but can be scary to people with height sensitivities. The wall isn’t that high, so I would definitely keep a close eye on children. Eating Nearby: There are two restaurants inside the Guggenheim: Cafe 3 offers drinks, pastries, and premade sandwiches in a casual setting. The Wright is a more formal, but still family friendly, full service restaurant, open for weekday lunch and weekend brunch. I would walk to Lexington and Third for a wide variety of family friendly restaurants. There are literally dozens of choices. We stayed a little closer and went to Sarabeth’s on Madison and 92nd Street for a delicious brunch. I’ve also been to the Barking Dog (Third Avenue & 94th Street) which is super casual and also has a very good brunch menu on the weekends. They’ll practice self control- it’s tempting to want to touch every painting but it’s critical everyone keeps their hands to themselves. They can look for the little details- At first glance, your child might assume a shape or landscape is one particular image. But if they pause and look a little closer, (but not too close!) recognizing the details will help them see a whole new concept. They’ll log out of technology for a while and hopefully truly see what’s in front of them. They’ll be reminded how to use indoor voices. They’ll need to be aware of everything around them- not just the art in various shapes and locations on walls, but the people who might be taking a photo, or reading a placard, or listening to an audio tour. It’s important for children to be conscious of their surroundings. They will appreciate different perspectives and learn that two (or more!) people can look at the exact same thing and see something different. They can attend special programs like artist talks and engage adults in the creative process. They can learn about new places and cultures. Many artists paint and sculpt elements of their heritage and culture and art is a wonderful way for those details to be three dimensional. They’ll practice their reading skills. Reading a description of a piece of art and biography of the artist will broaden children’s understanding of an artist’s inspiration or motivation. Most importantly: children will be inspired to express their own creativity and learn that art should be valued, respected, and enjoyed by everyone.